Kanom Jeen [ขนมจีน] is soft and thin noodles made from fermented rice. 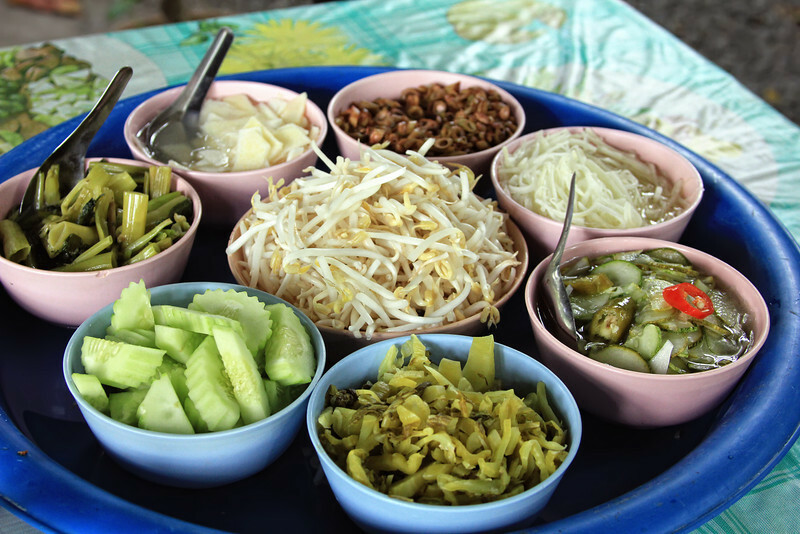 The way to eat Kanom jeen is to top it with a variety of curries (you could mix everything together or only the one curry you like) and eat together with any number of fresh, blanched, and pickled vegetables. 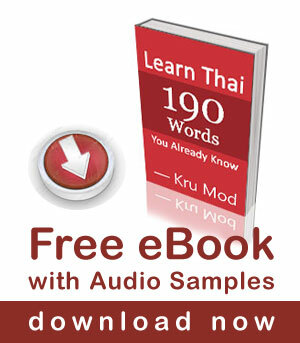 The most basic condiments are long beans, pickled mustard greens, shredded cabbage, sprouts, and Thai basil leaves. In the south สะตอ [SaTaw] aka stinky beans (carried in long, flat and wavy, over-sized, bright green seedpods. Each seedpod yields only a small handful of seeds.) are commonly added in the tray. 1. น้ำยา /nam ya/ : The fish curry sauce made with fish, ginger, garlic, shrimp paste, shallots, galangal, lemon grass, peppers, coconut milk and fish sauce. 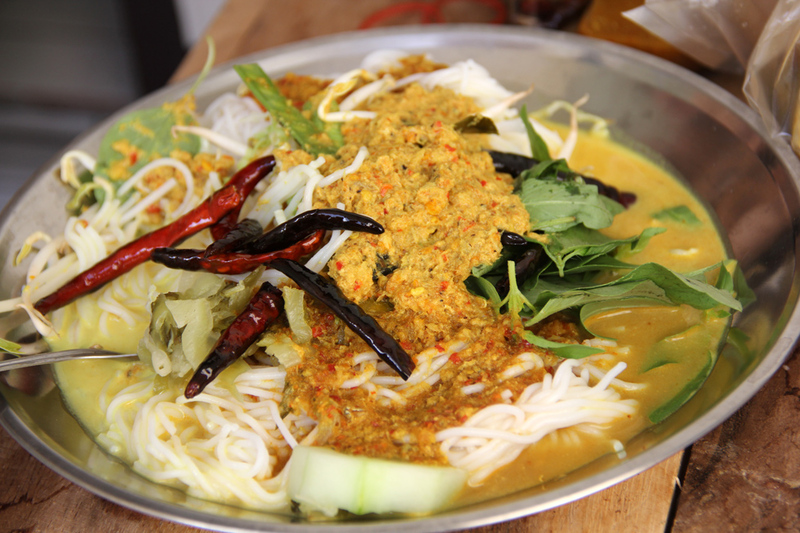 Khanom jeen is commonly served topped with a curry of your choice and vegetable. In Northern Thailand, you will find ขนมจีน น้ำเงี๊ยว – khanom jeen nam ngiaw more common, this curry is made with garlic, red curry paste, yellow bean sauce, diced tomatoes, turmeric, fish sauce, spring onion and coriander, with either chicken or pork ribs. To try this dish in Bangkok the convenient place would be Kanom Jeen Buffet Chao Din, which is 59 baht for all you can eat on the 5th Floor of MBK (Maboonkrong) Mall. Have you had Kanom Jeen before? 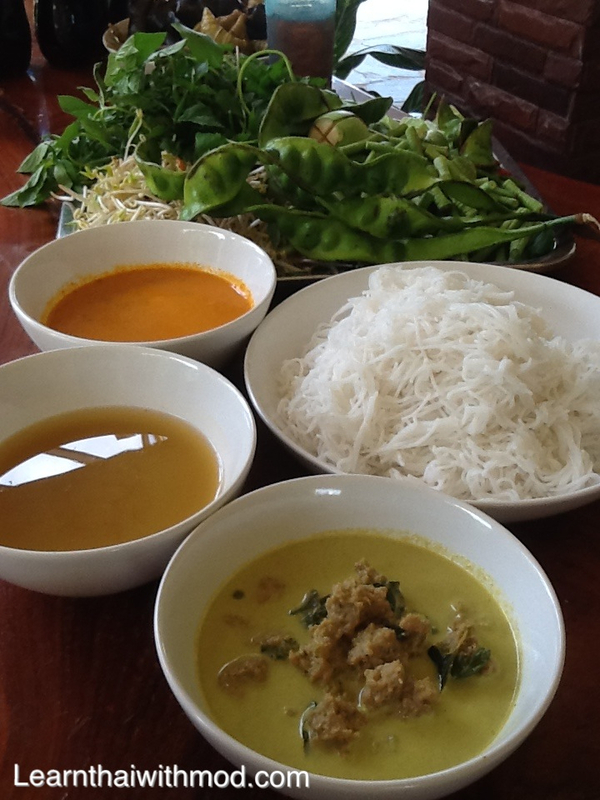 what are the best places for this signature dish in Nakhon Si Thammarat ?